For midsize and fast-growing small companies that need to optimize their business and outperform competition, the SAP S/4HANA edition for SAP Business All-in-One is the most powerful, industry-specific solution available in the market. 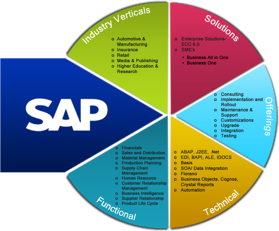 This solution is the next generation of SAP Business All-In-One and offers the simplification and innovations introduced in SAP S/4HANA product which also includes the SAP Accounting powered by SAP HANA. And based on decades of experience with growing companies, SAP has preconfigured the most-utilized functionality for business management in the SAP® Business All-in-One rapid-deployment solution. If you’re a smaller midsize company engaged in manufacturing, service delivery, or wholesale distribution, you benefit from a single, integrated solution that has been designed to help you manage and control the core aspects of your business – including finance, human resources, procurement, supply chain, manufacturing, and product development. For more information please contact Mark Burt (mburt@d1tech.net) at 803-740-5008 or Lori Kimball (lkimball@d1tech.net) at (781) 258-1274. Do You Need Help in Packaging inside SAP Business One? How to Set Rate for Selection Criteria in SAP Business One! Setting Batches? Choose The UoM in SAP Business One! How to Set Your Sequence for Check Printing in SAP Business One!